(Diana Ulloa | The Associated Press) Migrants from El Salvador board a truck as they start on their way to the United States, from San Salvador, El Salvador, Wednesday, Oct. 31, 2018. 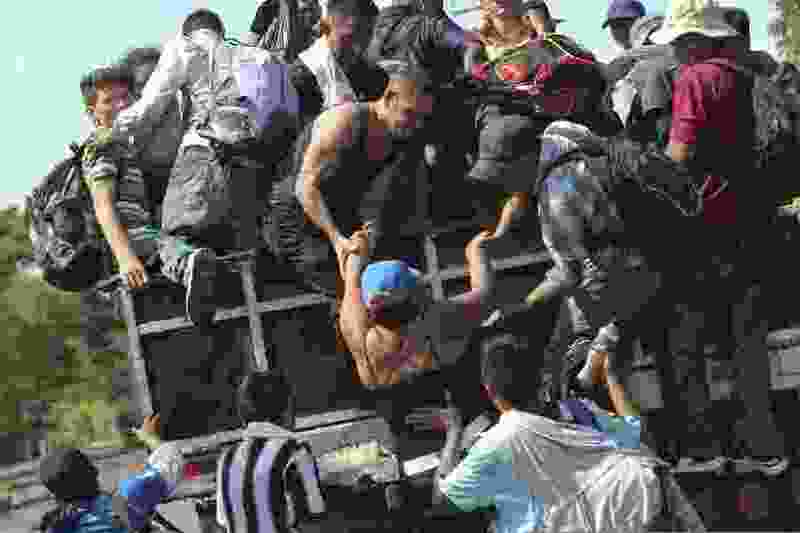 A third group of migrants from El Salvador had already made it to Guatemala, and on Wednesday a fourth group of about 700 Salvadorans set out from the capital, San Salvador, with plans to walk to the U.S. border, 1,500 miles away. President Donald Trump suggested Wednesday that there might be truth to an unfounded conspiracy theory that philanthropist and Democratic megadonor George Soros is funding a caravan of Central American migrants, telling reporters that he “wouldn’t be surprised” if that is the case. As he left the White House, Trump was asked whether he thinks somebody is funding the migrant caravan that is slowly making its way through Mexico toward the U.S. border. "I wouldn't be surprised, yeah. I wouldn't be surprised," Trump responded. Asked whether the funder could be Soros, Trump said: "I don't know who, but I wouldn't be surprised. A lot of people say yes." Trump's comments came in the wake of Soros being targeted with a pipe bomb last week and the fatal shootings this weekend at Pittsburgh synagogue by a suspect who posted frequently about the migrant caravan. The White House did not immediately respond Thursday to a question about what evidence Trump has that points to the possibility that Soros, a wealthy Jewish donor, has funded a caravan that originated in Honduras. In the run-up to next week's midterm elections, Trump has repeatedly pointed to the caravan as a symbol of what is wrong with U.S. immigration policy and blamed Democrats for not passing legislation in a Republican-controlled Congress. Trump told reporters that he considers such caravans "very dangerous," adding: "We're not going to allow people to come into our country that don't have the well-being of our country in mind." The theory about Soros funding the caravan dates to late March, when an earlier wave of migrants was heading north. The rumors circulated on Facebook groups and various right-wing websites, as well as on left-wing sites seeking to debunk them. The rumors cropped up again in recent weeks when a new caravan started receiving attention among conservatives. Rep. Matt Gaetz, R-Fla., posted a video on Twitter of someone supposedly handing cash to migrants to "storm the US border," and he asked, "Soros?" Fox News host Laura Ingraham and Fox Business hosts Maria Bartiromo and Lou Dobbs have also raised the possibility that the caravan is getting outside funding. Cesar Sayoc, the Florida man authorities have accused of mailing more than a dozen bombs to people who have criticized Trump, appeared to be obsessed with Soros, mentioning him dozens of times on one of his Twitter accounts. Robert D. Bowers, charged with killing 11 people Saturday at a Pittsburgh synagogue, also reposted several viral comments on a since-deactivated social media account about the migrant caravan. One post described the "third world caravan" as a group of approaching "invaders." The Washington Post’s Joel Achenbach contributed to this report.